TORTOLA, British Virgin Islands, Jun. 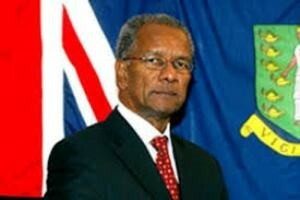 19, CMC – Premier Dr. Orlando Smith has announced that he will not be seeking re-election as leader of his National Democratic Party (NDP) at the upcoming convention on the weekend. Smith, 73, who made the announcement in a broadcast late Monday, said he made the decision after ‘much thought and prayer’ and after discussions with family and colleagues. “And so, when the NDP comes together in its upcoming Convention, I will not seek nor accept the nomination to lead the party into the next election,” the premier said. The decision made by the Premier means that the only confirmed contenders to succeed him as party leader are Education Minister Myron Walwyn and Health Minister Ronnie Skelton. During this weekend’s convention candidates will also be contesting the offices of vice president, secretary, deputy secretary, treasurer, deputy treasurer, chaplain, chairman of the youth movement, and chairperson of the women’s association.